By Gerry Stoker, Mark Evans, and Max Halupka. Gerry Stoker is Professor of Governance at University of Southampton and Fellow and Centenary Professor in the Institute for Governance and Policy Analysis at University of Canberra (Twitter). You can read more posts by Gerry Stoker here. Are younger generations apathetic about politics, combining complacency with self-absorption, and so threatening the future of Australian democracy? One of the strongest findings from decades of research is that what citizens do politically in their early years tends to set the trend for their engagement with politics in the future. So, it matters that we understand how younger generations are engaging with democratic politics by comparison with older generations. The findings of our survey work and analysis challenge negative stereotypes and give grounds for optimism. They show that within the younger generations are citizens with the enthusiasm and capacity to change Australian politics. … young Australians value their democracy less than their counterparts in Indonesia (an emerging democracy), India (a newer democracy than ours) and Fiji (not a democracy at all). But are younger citizens uninterested in democracy? Are they switched off by politics more than other generations? We think not. The idea of a generation or cohort of people born around the same time is an important one in social inquiry. Cohorts matter because they are potential drivers of change in society. The mix of continuity or change from previous generations is shaped by differences in education, peer group socialisation and unique historical experience. So society reproduces itself, but the result is likely to be a mix of stability and innovation as each generation’s experiences come into play. We focus on four generations of Australian citizens: those born between 1925-45 – the Builders – reflecting their role in rebuilding Australia after the second world war; the Baby Boomers born between 1946-64 who are seen as having driven social change from the late-1960s onwards; Generation X (from 1965-79) and Generation Y (1980-94). These last two are of particular interest as they mostly came of voting age in the 21st century. Our survey work underpins the “Power of 1 Voice” exhibition at the Museum of Australian Democracy at Old Parliament House. Conducted by Ipsos, the survey was designed to capture a representative sample from each of the four Australian generations that we were interested in. The first thing it tells us is that the great divide is not between engaged older generations and apathetic younger generations. In practice, both do politics, though with varying levels of enthusiasm. However, what is clear is that both do politics differently. We asked how our respondents engaged with politics. We divided the answers into those that reflected more traditional forms of doing politics and those we labelled more contemporary. Traditional forms included taking an active role in the community; joining a political party; presenting views to an elected representative; attending a demonstration; standing for office; taking an active part in a lobby or campaign; boycotting products for political or other value-based reasons; and the ubiquitous signing of a petition. Contemporary forms tend to reflect the options available online. These included using social media; contributing to blogs; getting involved in an E-campaign; joining an online advocacy group; and engaging in crowd-sourced funding for a cause. The results, presented here, show that different generations are doing their politics differently. There is not a straight dichotomy between older generations doing everything traditionally and younger generations doing everything in a contemporary style. However, the overall pattern is very clear. The older generations do more through conventional forms of political engagement; the younger generations do more through contemporary forms. In short, it is not that young people do not participate in politics. Rather, they participate differently through different channels. So far all that Tables 1 and 2 tell us is that younger citizens are more comfortable with newer technology and so it’s no surprise they use it more. We did a bit more analysis to explore why younger citizens might do their politics differently. The answer is that they think that doing it that way is more effective. It’s not a question of ease of access alone; there is a view that politics online achieves more among younger generations. All generations judge traditional tools as effective to a degree, but older generations are stronger in their backing of traditional tools than younger generations. Younger citizens are more convinced by the efficacy of online tools. They are convinced that they have more impact that way. That in turn suggests that these new online forms are not a passing fad, but likely to grow in significance if younger generations remain convinced that they can make a difference through online activism. So far we have emphasised the differences between generations. But when it comes to thinking about how to reform the political system, there is a remarkable conformity across generations. All generations think that contemporary politics is in trouble. A majority of all generations admire democratic politics for the stability and benefits it delivers and the opportunity it affords to hold politicians to account to ensure their performance in meeting citizens’ needs. Equally, a majority of all generations’ fears about the practice of democracy coalesce around ideas that too much power is concentrated in the hands of big business and the media. Consequently, politicians too easily break the promises they have made. The two most supported reform options can be seen as a response to this observation. The first is focused on the idea of giving citizens more influence and parties less. 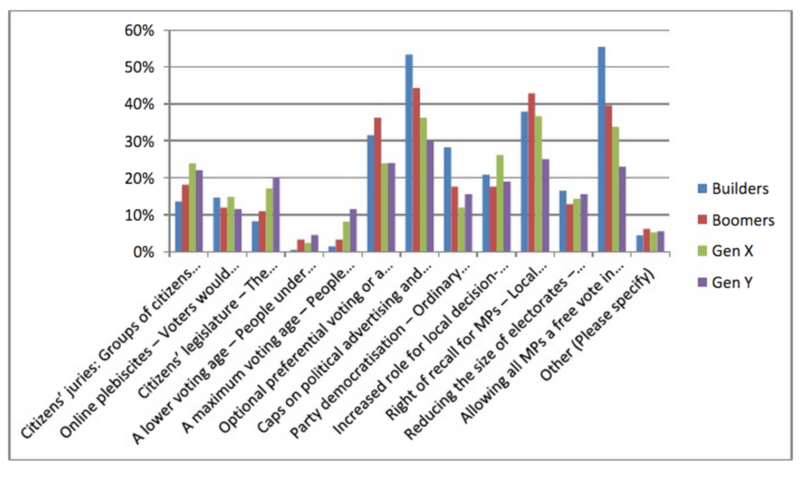 This might involve placing caps on political advertising and donations, more free votes in parliament, the opportunity to go for “none of the above” when voting, the right to recall MPs and the greater use of online plebiscites to give voters a chance to express their views directly. The second option goes along with much of that agenda but is distinctive in its support for greater local decision-making. It is noteworthy that a majority of citizens appear to favour a mix of reforms combining mechanisms to free and open up representative politics with an opportunity for more direct intervention by citizens themselves. What reforms would you make to the current system, by generation. Negative stereotyping of younger generations as apathetic, apolitical and disengaged is mad, bad and dangerous for the health of Australian democracy. Our evidence suggests that young Australians passionately believe in democratic values, possess strong political views and are actively engaged in contemporary forms of participation. They simply do not like the current politics on offer through traditional forms of participation. The message to mainstream political institutions and parties is clear. A new politics is required to win the hearts and minds of young Australians to ensure that their democratic energies nurture and enhance Australian democracy. This different politics needs to be more participatory, open, local and digital. It’s probably true to say that each generation has a tendency to bemoan the failings of the one that follows it. But, in our view, it is evident that politicians accuse younger voters of apathy to divert attention from their own behaviour. What they fail to see is that Australians see politicians as the source of the present crisis.